« Mark Bove vs. Bobby Flay … and then what? 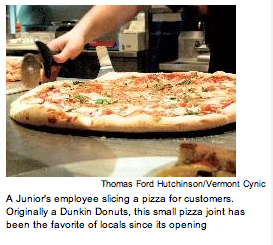 The smell of freshly baked pizza and the sound of avidly talking diners surrounds customers as they walk past Junior’s. Located at 167 Main Street, the restaurant was constructed in an old Dunkin Donuts store, yet now, one could not imagine a donut store there instead of this little pizza joint. There are a few tables in the restaurant that are covered in classic red and white checked tablecloths, as well as a dining counter looking out at busy Main Street, which is perfect for people watching. While in line to order, a customer can easily see pizza dough being tossed in the back of the kitchen, and they can look at the different varieties of individual pizza slices in the case next to the register. Although the menu is located somewhat awkwardly at the front of the restaurant, with only one other copy on the wall next to the door, the staff at Junior’s and the superb food completely remedies any difficulties looking at the menu. The two members of the staff interacting with the customers were exceedingly accommodating, quick and helpful. They took orders accurately and were prompt to bring extra cheese and plates. Even though there were only two people working the counter, every customer’s need was thoroughly met. The pizza came out just as quickly as the staff helped. The restaurant was packed, adding to the classic pizzeria atmosphere, yet there was no significant delay in waiting for one’s order. A fountain drink stand made drink refills speedy, and the pizza came out promptly at the perfect temperature. The crust was crispy, while simultaneously being quite soft on the inside. Covered in onions, peppers, mushrooms, sausage and pepperoni, the original specialty pizza lacked nothing in the way of toppings and the vegetables were not over-cooked or soggy. The menu was full of a wide variety of toppings, and the specialty pizzas were easily suited for many people’s individual tastes. There were slices of pizza of any kind available for sale as well, enabling anyone to still enjoy the company of a group while eating exactly what one wants. While there are other delicious-sounding options on the menu apart from pizza, such as Panini sandwiches, calzones and pasta, Junior’s seems to be a primarily pizza-oriented restaurant. However, this does not allow the presence of their marvelous baked goods to go unnoticed. There are many different Italian and classic baked goods available, whether one desires an individual sized éclair or a large chocolate cake. The pastries are kept in a glass-faced refrigerator easily seen from the dining area to draw in those customers with a sweet tooth. Apart from the delectable options available for immediate consumption in the restaurant, there are custom birthday cakes, wedding cakes and assorted cookie platters that need to be ordered in advance, according to Junior’s website, http://www.juniorsvt.com. Despite its size, this little restaurant has a lot to offer, providing one with a delicious meal and the perfect dose of classic Italian pizzeria atmosphere. It is definitely a restaurant to keep on the pizza-lover’s list of places to revisit. Published by The Vermont Cynic on 04/29/2008. Read it here.